Banner advertisement to maximize your ad revenue. 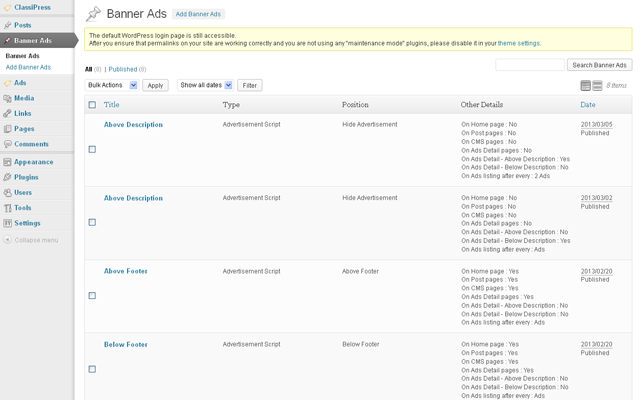 This plugin allows you to add the advertisement banner and advertisement script like Google Ads. You can set the Different Advertisement for different pages like the home page, different category listing pages, ads detail pages, content pages for different places like above header, below header, above footer, below footer, above listing start, below listing end. Also for ads detail page above and below ads description. Same way the plugin has the feature such a way that you can set your advertisement after every ads listing of 2,3,4,5 or 6 for listing page. Please see screenshots & demo for more details. 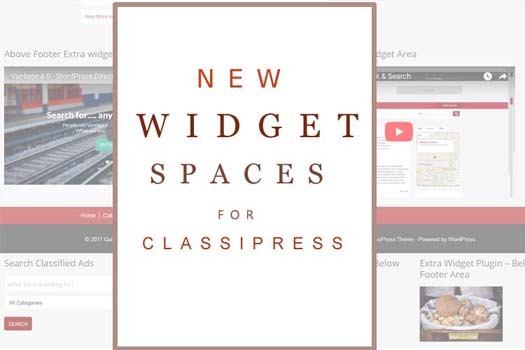 This plugin works with ClassiPress only. It is also compatible with WordPress Multi-site. Banner advertisements to maximize your ad revenue. Sequential banner ads after every number of ads like after every 2 ads or after every 3 ads and so on. new feature Sliding effect if display number of banners are more than one for a single place. Insert sliding banners from same banner post. new feature Add upto 5 banners for sliding. Using jquery.cycle.all.js fade effect for sliding the ads. new feature Expiry Date added. Slider speed & effect change as per banner settings. Display banners for Ads Tag listing page same as Ads category page. Important note for version : 1.0.6 upgrade: Expiry date is must otherwise all banners will be gone. Please read change log for more details and how to set expiry date automatically for all banners. Otherwise you should manually set expiry date for each banners one by one. Added shortcode to display banners. ClassiPress Version 4.0 related update. Above & Below loop for home page, category pages, tags pages & search page not working after ClassiPress Version 4.0 because there is not filter/action hook for that. sequential banners is not working properly. it will work by leaving one number on start and end of loop. for example : if you want to display sequential banner after every “2” ads, on first ad it will display after first ad and before last ads. Between that it will display only after every “2” ads. sequential banners will not display properly for home page Latest Listings because of grid listings. Added filters for different pages banner ids. On search page display banners with search and category search combination. Banners display for all pages by default, there is no option to hide banners for specific pages. Ignore/hide banners display for specific pages — NEW option added on banners add/edit page settings. 1)Advertise plugin dosen’t working for footer section of ads detail page. 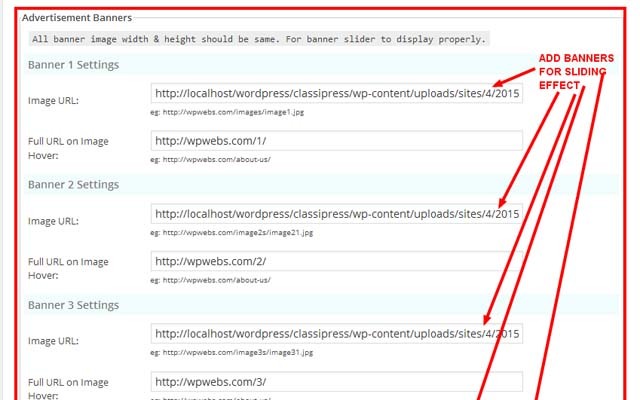 ==>It is a problem in the file is :: sidebar-ad.php from your classipress theme folder. We have report to apptheme team for the problem. 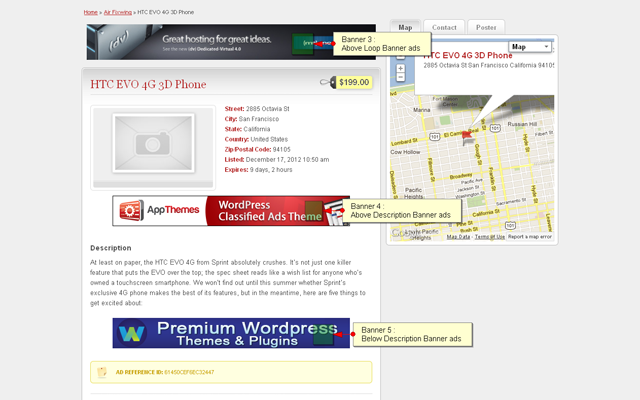 2) Is the Banner Advertisement allow rotating banner/sliding banners? ==>Sorry, we have provided only static banner for current version, you can add video,flash or any advertisement script instead. 3)Banner Advertisement is responsive(view able for all most size device) ? ==>Yes Banner Advertisement is working ok for all size of device automatically. 4)How to make Google Ads script, advertisement flash or any other advertisement script responsive(view able for all most size device) ? ==>Please refer the plugin document to make Google Ads script viewable for all most size of device. Related to video, flash or any other kind of advertisement script you need to add css style below to make it responsive. 5)How to add banners in sidebar? –go to wp-admin > widgets > drag & drop widget “Banner Galler – Sidebar Banner Ads” to the sidebar widget area where you want to display the ads. 7)Read Usage, Notes & Developer Notes Carefully. — Banners in slider view not display while user not login because of some problem – SOLVED. — Banners display for all pages by default, there is no option to hide banners for specific pages. — Ignore/hide banners display for specific pages — NEW option added on banners add/edit page settings. — ClassiPress Version 4.0 related update. — Above & Below loop for home page, category pages, tags pages & search page not working after ClassiPress Version 4.0 because there is not filter/action hook for that. — Important NOTE :: sequential banners is not working properly. it will work by leaving one number on start and end of loop. — Between that it will display only after every “2” ads. — sequential banners will not display properly for home page Latest Listings because of grid listings. — Added filters for different pages banner ids. — On search page display banners with search and category search combination. — Added widget option to display on tags listing. — Added widget option to display on search page. — Added widget option to display on blog category pages. — Added widget option to display on blog tag pages. — Added widget option to display on author pages. — Added widget option to display on ads paginations. — Removed the extra block displa while there is no banner for specific page, mainly for sidebar widget section. — Widget display blank if condition not match — Problem solve. — Now if condition not match, the blank box will never display. — Widget filter added for custom post type. — Banner add/edit from wp-admin >> if number of tags are very much like 2000 or more the page not loaded – Problem solve – Now you can see only popular 500 tags. — Banner add/edit category and tags selection make easy. Not by one click you can make all category and tags selected. — Display banners for Tags also. — Slider timer change as per you want. where “wpw-fr_FR.mo” will be your local language file that you should create in “languages” folder. — CSS change for bigger banner image. — Added plugin usage document with more details inside readme.txt file. 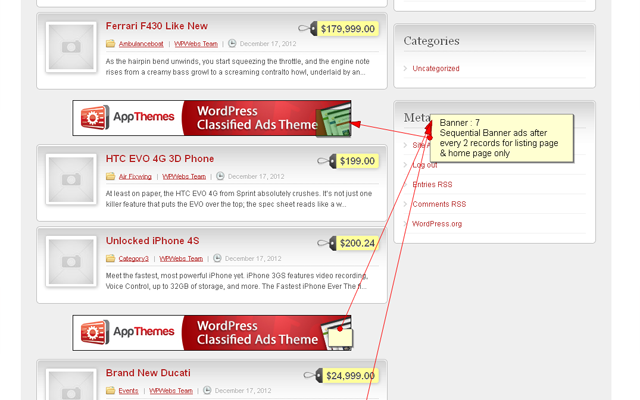 — ADDED NEW OPTION : Display sequential banners for home page and all category listing. — Banner Expiry date added. — You can set the expiry date so banner hide as per date you have added. — Expiry date is must otherwise all banners will be gone. The easy way to set expiry date for one month later is below url. It will set the banner expiry date to next month of same date. see the direct link on plugin list page with plugin description from where you active/deactivate the plugins. — You can see the expiry date in the banner listing page. — Advertisement make easy and faster. — Display more than one banners as sliding banners. — Display multiple sliding banners by add more than one banner post. — Add up to 5 banners in single banner slider from banner post. — Added Sliding effect if display number of banners are more than one for a single place. — Using jquery.cycle.all.js fade effect for sliding the ads. 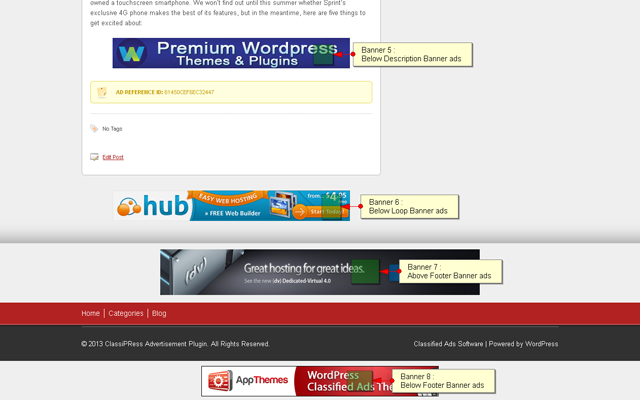 — Wp-admin > extra fileds ralted to locations on add/edit banners > removed. 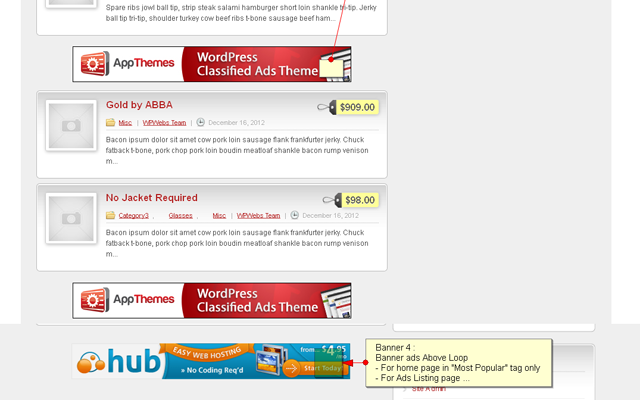 –(NEW Feature) Changed the sidebar ads widget, you can select ads as per added & use any where as per options given. — Home page sequence banner ad problem – solved. — Category listing page sequence listing banner ads was hang the page. — Solved. 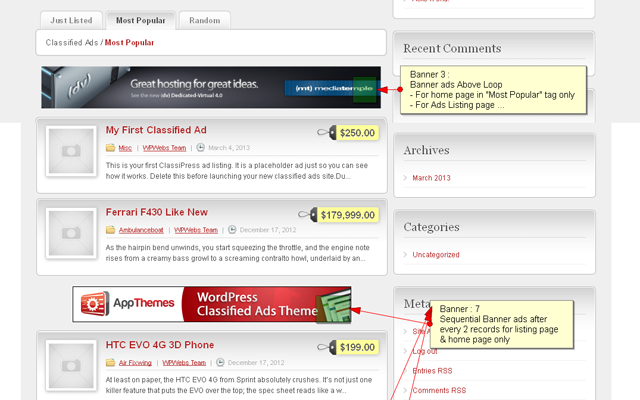 — Show banner in sideber (via widget) Option added on banner add/edit page of wp-admin. 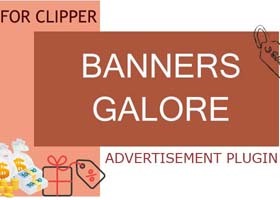 — Banner Galler-Sidebar Banner Ads (New widget added) in wp-admin > widget section. — like show on home page or on selected category pages. if not selected any thing, it will show for all. An excellent and expected plug-in for users deserves all the money. I like this plugin very much. If you could add the possibility of splitting in columns would be great. Thank you. You may send me your child theme so I can check it. Banners Galore is a state of the art plugin. 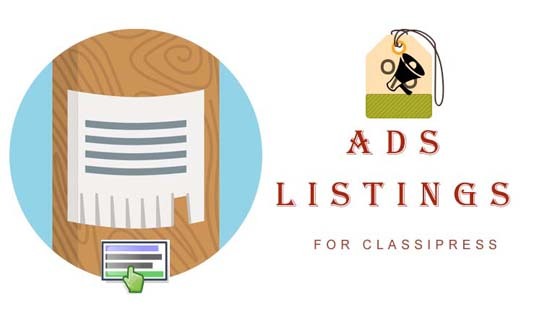 In addition to the obvious benefit of being able to post banner ads everywhere, it also creates the necessary space for posting blocks of text, as normally there is NO place one can post text in Classipress. Having the ability to post blocks of text in different locations is a huge help for SEO optimization. With the most recent updates, we can now select all categories and all ad tags with one fast click. It is worth every penny x 1000 and I strongly recommend. I also am deeply impressed by the sincere professional timely support I have received from Vipul. i have thid plugin an the ad scroller plugin. But at same time it doesnt work. I must deactivate it. Ssorry i cant get my money back. Please update this plugin. Would you please send me ” the ad scroller plugin” that you are using right now for your website and your website url so I will check all settings and make correction if any. Please don’t forgot to add your problem detail in the email for better understanding. A must have for every classipress site. A great product. I only found it difficult how to change the permalinks. For now, the plugin works very well. The service is excellent. I will let you know if there will be problems in the future. Congratulations. Lo he instalado en ClassicPress y lo he configurado para que se muestre cada 5 anuncios, dado que la capacidad de mi sitio es mostrar 10 anuncios por página, entonces puedo mostrar la publicidad cada 5 anuncios, es decir 2 por páginas. El problema es que solo lo hace en la pagina 1, mientras que en el resto de las categorías no se muestra ninguna publicidad. I needed to use this plugin on a LOT of sites. I have decided against using it as you have to manually click all the radio buttons for the categories you wish to display the banner ads in. My sites all have 20+ categories, so manually clicking them all over and over again is too much. Would use if you implemented a “select all categories” feature. i like it…just wish there were more places to put banners. more banners.different sizes.. Instructions are not clear. Product does not work with other items in the Market Place like child themes etc. Banners Galore available for VANTAGE ? Hi – I’m looking for such a plugin to use in VANTAGE? There is no such feature for current version of plugin. We will add this feature in next version soon. Is this plugin ready to work with ClassiPress 4? 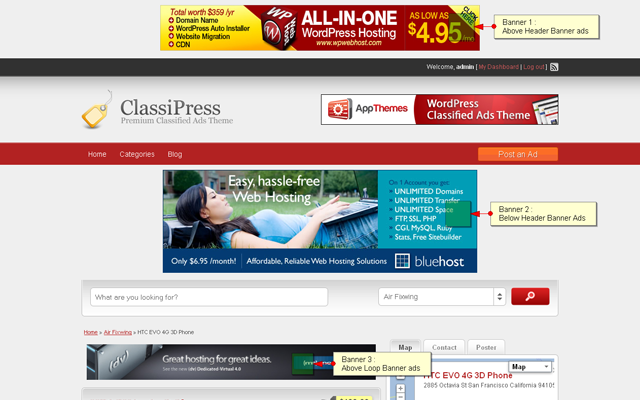 the plugin is working for ClassiPress 4, you may refer change log for more details. The banners are not displaying correctly on the home page Latest Listing in Grid View. Can you Take a look, please? why do you insist on removing feedback that you dont like? since day 1 your plugin has been riddled with bugs. its functionality is dated , it make dinasaurs look young. you never sort problems , you delete comments YOU dont approve of . many plugins come with lifetime updates ,yours only 12 mnth and leaving people with security holes in there sites , solution is update at a cost , id call that blackmail , id rather delete your plugin . — Please make sure what kind of problem you are facing with that plugin you should describe in detail? — Actually we cannot say what kind of error you may facing but as per different server environment some time our client faces many problems and we try our best to solve it. But for most of website there are shared hosting with common features so there is no problem with any plugin or theme. — Plugin you should purchase once with 12 months support & update and if you want more update then 12 months you should buy plugin support only with very few $ not full amount of plugin price. after 12 months we only charge for supports not plugin code. –It is not necessary to update plugin every time but major update is require to updated only if you update the theme. We have to update and change plugin as per theme updated by appthemes. 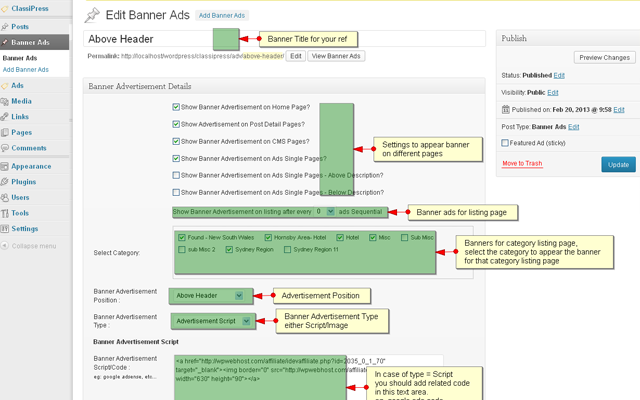 Enables many new banner ad spaces throughout Clipper.